It's time for the Santa Clarita Valley Sheriff's Station Toy Drive! The Santa Clarita Valley Sheriff’s Station has once again begun collecting toys as part of the Annual Holiday Toy Drive. Deputies have been working with the community to collect and distribute toys and gifts to less fortunate children in our community. We are teaming up with KHTS Radio AM 1220 and Frontier Toyota to officially kick-off our toy drive on Wednesday, December 5, 2018 from 4:00 to 7:00 pm at Frontier Toyota, 23621 Creekside Road, Santa Clarita. 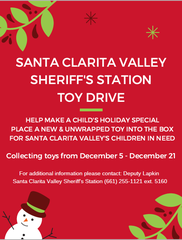 If you would like to make a difference in the life of a child, you can donate a new, unwrapped toy at the Santa Clarita Valley Sheriff’s lobby anytime between now and December 21, 2018. For more information, please contact Deputy Fanny Lapkin at (661)255-1121, ext. 5160.